Perhaps it was because of the heavily tattooed yakuza, perhaps it was because of their ability to see art in everything from pouring tea to the making of the finest swords the world has ever seen. What ever the case may be, Japan has been a major influence in the world of tattooing from at least it’s revival in the west during the 1800’s to the present day. Even during the “dark days” of western tattooing when sterilization was little more than a bucket of water with maybe a little bit of Lysol put in as an anti bacterial agent, and the same needle was used on whoever came through the door. Every artist worth going to had a rich selection of Japanese inspired designs on the wall somewhere. From koi fish to dragons the influence of japan’s tattoo artists have adorned the flash collection of almost every artist. Considering the length of time Japan has been tattooing western flesh, when you want to talk “old school” you’d be hard pressed to admit there are many styles as old school as traditional Japanese tattooing. Even during the 1800’s if you wanted the best, most artistic work you could get, you had to go to Japan. Japan’s influence on tattoo’s in general continue to the present day and nowhere is that more visible that the present craze to have a Manga tattoo. For the few who may not know, Manga is the generic term for the Japanese inspired art form used in everything from comic books to anime, and now tattooing. It’s easy to see why. Manga, with all it’s other uses, lends itself uniquely to some damn good looking tattoos. The over the top imagery of Manga is inspiring in it’s ability to convey a wide variety of emotions and if nothing else tattoos are an emotionally inspired art form. You can see a painting by a old master and think, “Yeah that’s nice.”, with all the emotion of a scientist examining a lab rat. You can not look at a tattoo with out it pulling some type of emotion out of you. 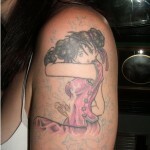 Tattoos are designed to illicit emotional responses, and so is Manga. Put the two together and you have all the makings of one hell of a cool tat. From cyber wizards who’s very expression reeks pure evil, to scantily clad girls that give the sexiest pin up girl a run for her money any day, the power of a Manga tattoo fairly leaps off the skin with an in your face, look at me feel that is rarely equaled. More and more Manga tattoos are showing up in the skin of collectors everywhere and the results are at times breathtaking. Especially when the artist understands Manga and can execute the design with the feeling put into the original artwork, or can make a unique piece in the same style. If your wnodering just how a Manga style tattoo would look in your own collection, or maybe you have been thinking of getting one, but just aren’t interested in Sailor Moon adorning your hide. 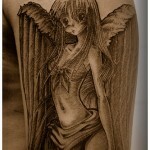 Check out the gallery at Tattoo Joy.com to see just how versatile this style of art truly can be. Hell, check it out anyway. There’s some great looking work there and a picture is worth a thousand words. Whether the statement is sexiness, cute, or raw power it is not easy to beat the use of Manga inspired imagery. 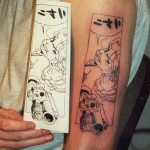 Just like the living flesh it adorns, a Manga tattoo comes to life for all to see the message that you want to convey…..or just for the hell of it.